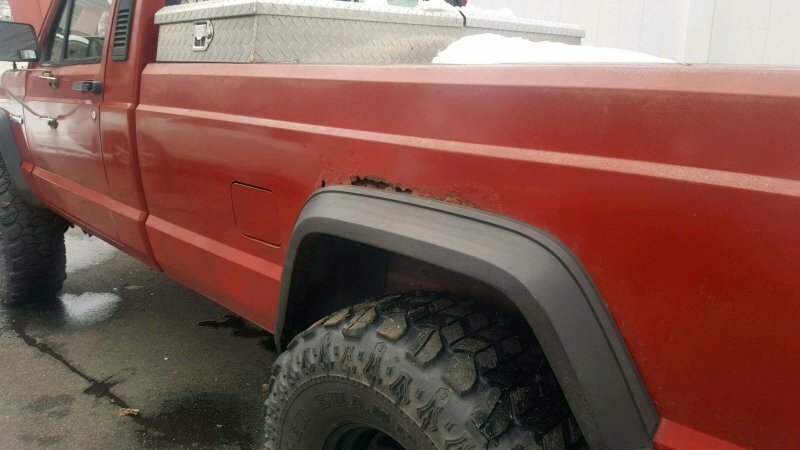 Really though it has some rust above the wheel wells I will want to address eventually. I bought this ford 8.8 off facebook marketplace, got a decent deal for it, $200. It came with 4.10's and a lunchbox locker. 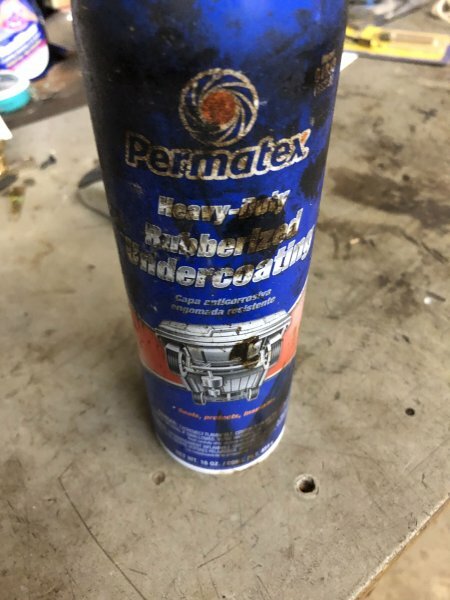 The seller bought it but didn't end up using it in their project. The calipers and the rotors are really rusty but the internals all look solid. 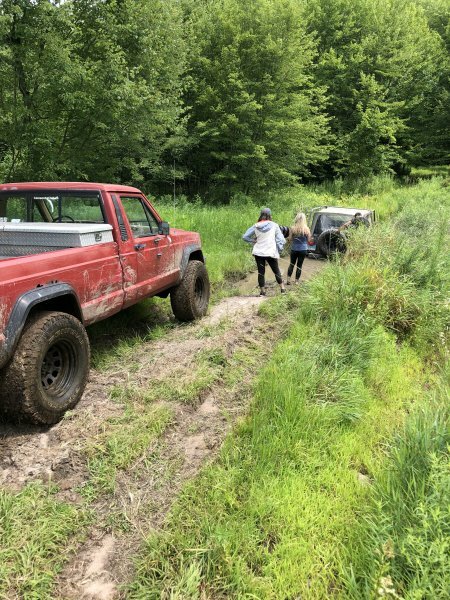 I won't end up putting this in for a while, I know the jeep will be down for a while once I start the swap so I want to wait until a couple upcoming wheeling trips are over. Good find. That a great deal with the locker and 4.10. 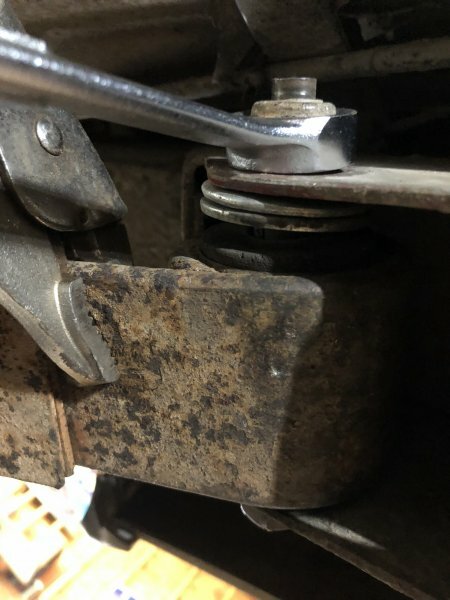 The front right sway bar lost it's lynch pin long ago so I temporarily put a pin in there (not exactly reusable). Bought this set https://www.harborfreight.com/50-piece-lynch-pin-kit-67544.html from harbor fright and put the other 49 in the barn for the future. Later on it actually lost the bolt too, so it was just dangling there and letting the body roll all around. Dog tax, look at this guy taking up all the space in the bed. Now that it's nearing the end of winter, I figure it's a good time to undercoat the jeep to prevent rust. 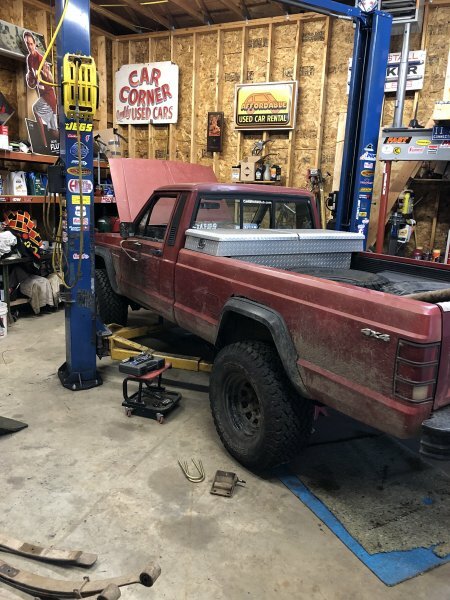 No worries, I haven't been driving it much because of the axle swap and break booster upgrade (pics to come). 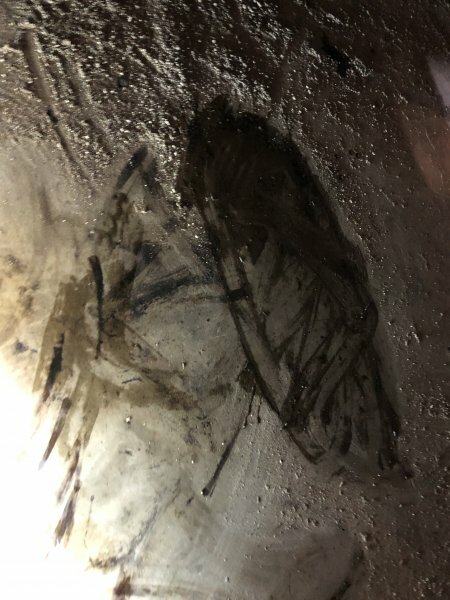 I hope it's not a big deal but I just washed away the dirt from the metal by using a rag and some water then oversprayed a little to make sure the layer covered the entire pan. Still have a water leak on the passengers side from the foot well somewhere. Someone mentioned the blower motor, I'll definitely have to look into that. 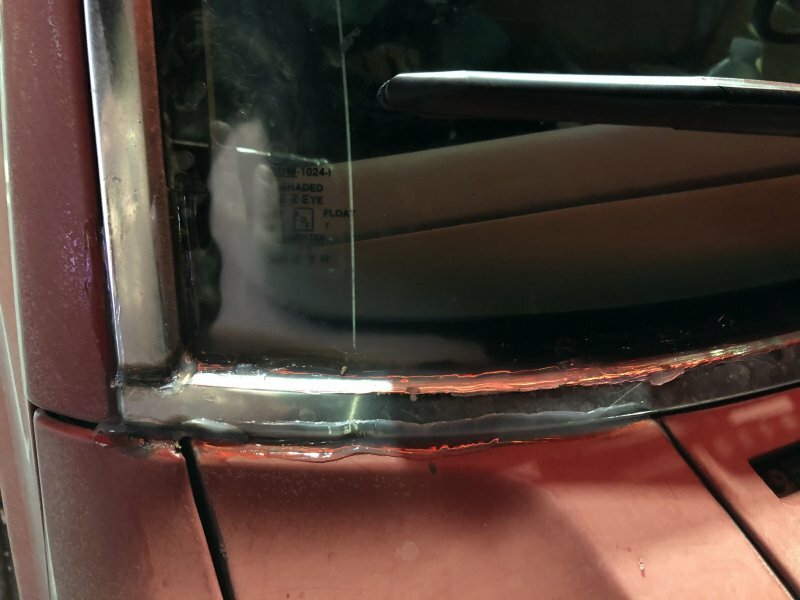 For now I used more silicon sealant on the window, which looks like it has some moisture trapped in there. I wonder if squirting some expanding foam around the blower motor will stop it from leaking water in through there. Maybe I'm misunderstanding how it works I've never been in there before. 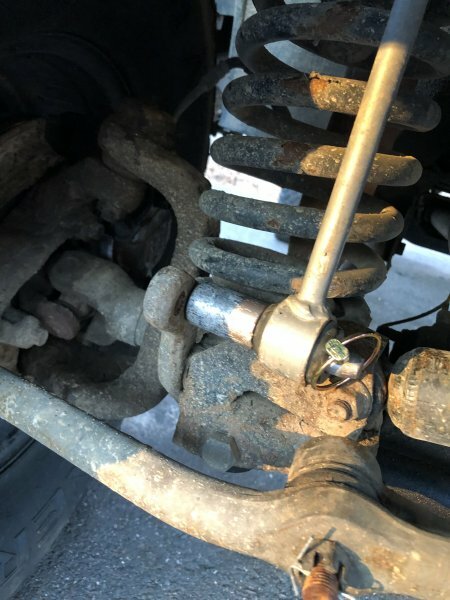 Threw a new bolt in the sway bar link, didn't really make a big difference driving around town. It doesn't see the highway very often, I don't need to take it to get to work. 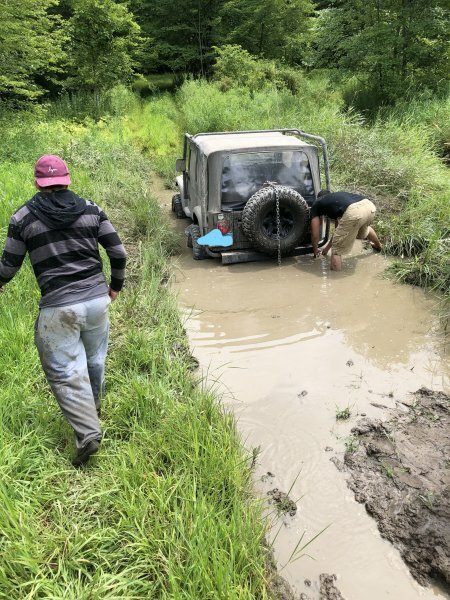 Got a call from a friend, someone he knew got stuck in a mud pit down the road. Just goes to show you shouldn't wheel alone. Luckily I live about a country mile away so I got them out quick. Not sure if it's the right way but I used reverse gear to pull them out. 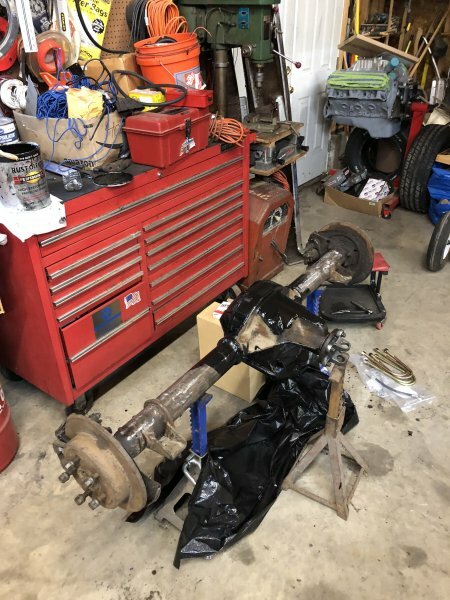 Time to start the axle swap, it's been sitting in the barn a while. To start I threw some gear oil in there and put the cover on. 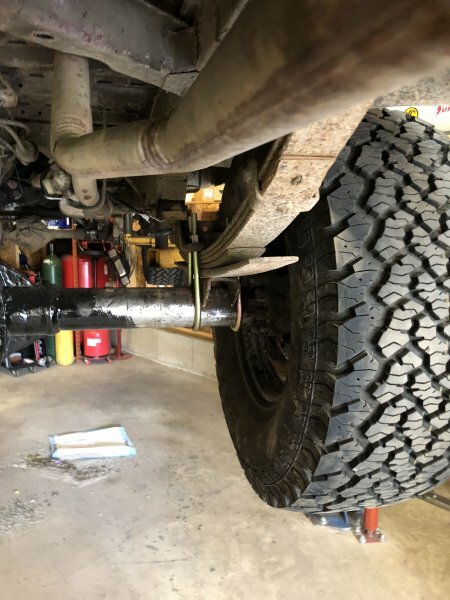 Luckily it was already set up for an XJ, I've read around and people say it isn't a big deal to let the leafs point a little inward as it's a 1/2" narrower than an XJ perch to perch. So I'm just going to leave the perches alone. 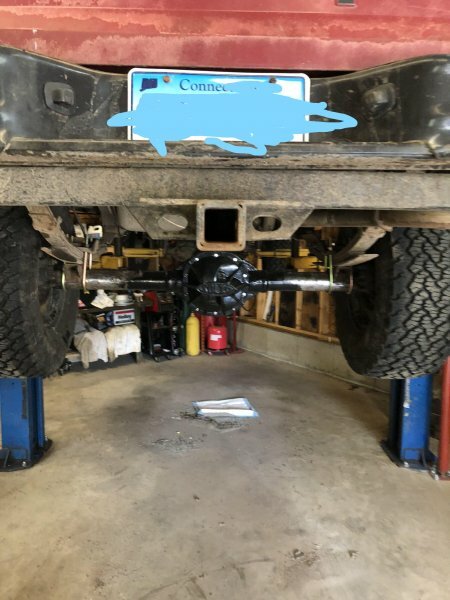 I painted most of the axle leaving a bit of space because I know I need to weld on some shock mounts eventually. I tried to set up the parking break but for whatever reason every parking break hardware kit I ordered didnt work. The springs were all way too short and couldn't span the gap between the shoes. I got frustrated and threw them out I figure I can get by without it. 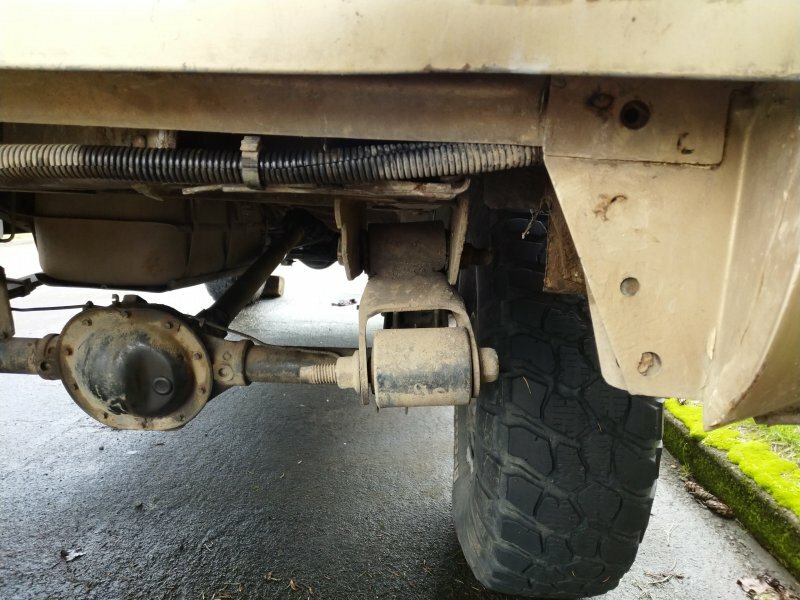 Pictured above I also bought new u bolts, and the flange to 1310 adapter (P/N 2-2-1379). 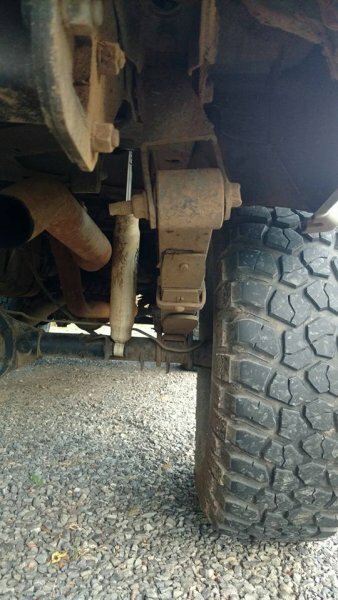 I know I'll need that so I can use my existing driveshaft. Tried to press a ujoint into the adapter and it just shattered. I messaged dana warranty dept and they shipped out a replacement, didn't even ask for the old one back when they saw the picture. 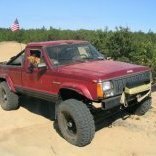 do NOT use the XJ perches as-is. 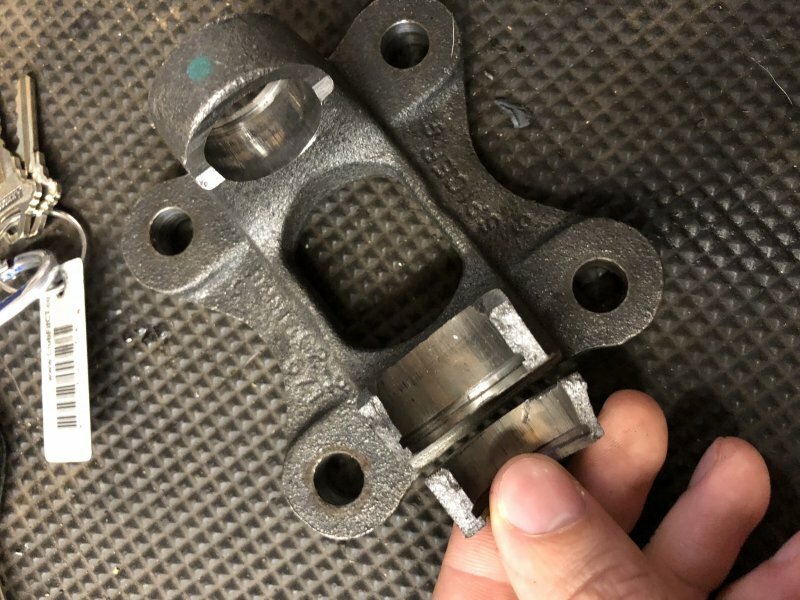 that "little" discrepancy will ruin the bushings in your shackles much faster than you think. then the axle will shift to the side and the truck will dogleg down the road. 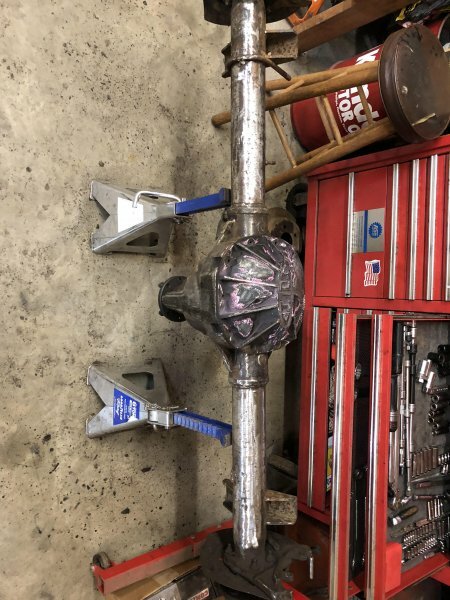 Here it is, in all it's glory, the old reliable dana 35. 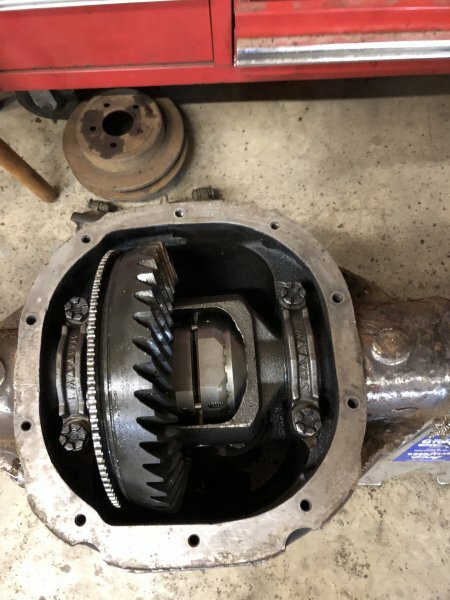 I popped the cover off just to double check the gears. It's a 3.55s open carrier but at least it's non c-clip. The axle never treated me badly, luckily it never broke, but I need to upgrade gears and drop in a locker. 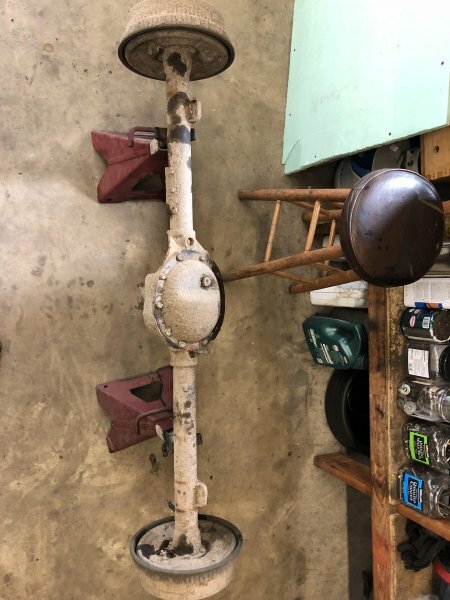 There's absolutely no way I'd upgrade a dana 35 when I could just drop an 8.8 in for a few hundred bucks. 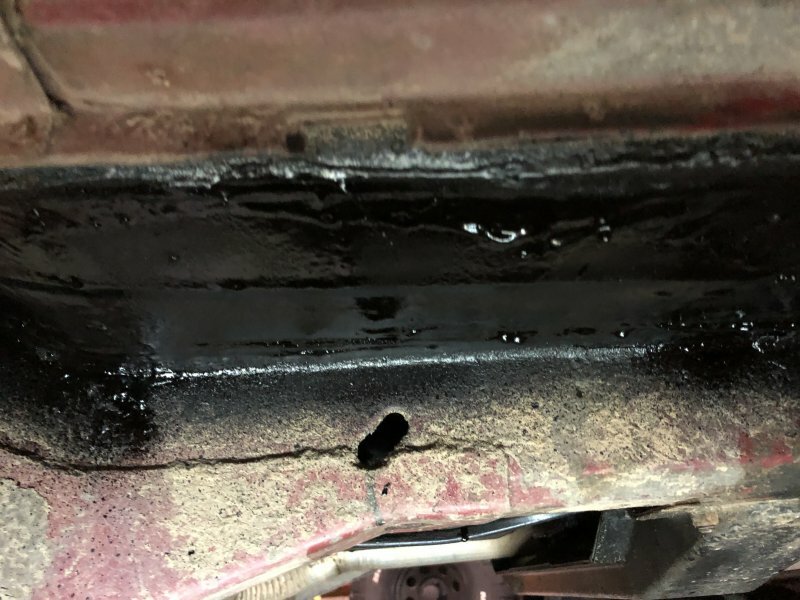 Oh no kidding, that looks terrible, are you sure those pictures are from an xj to mj swap? 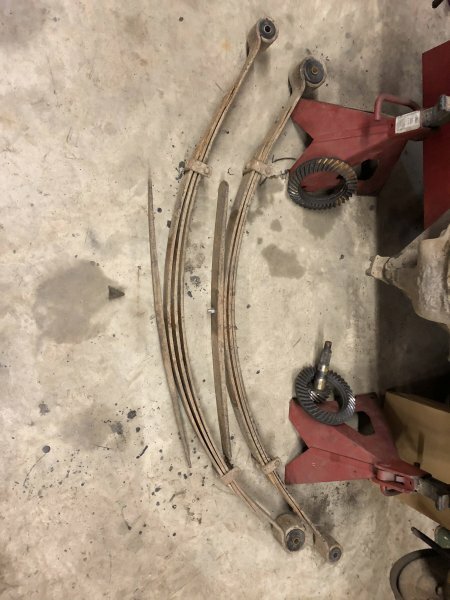 Mine doesn't look nearly that bad but I ended up using different leaf springs so it might have offset it. 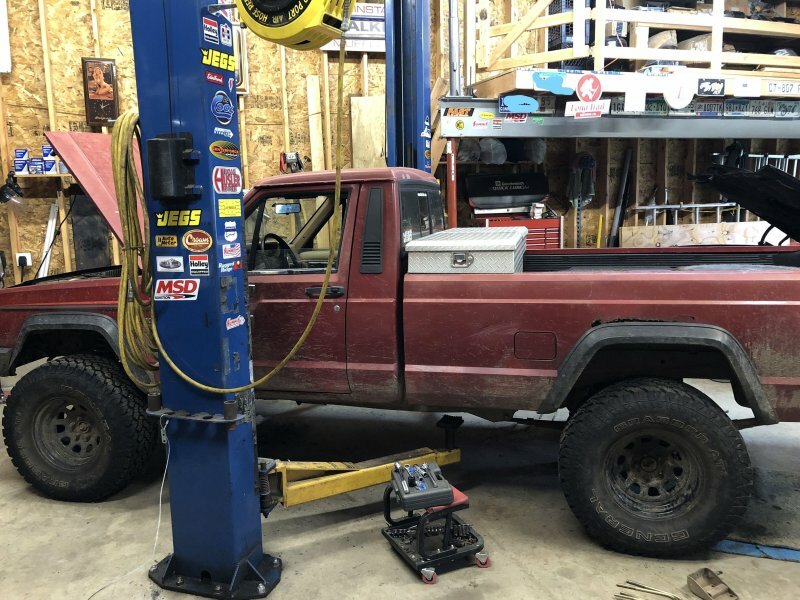 I already completed the swap about 3 months ago and have driven it about 500 miles since then. I'm only getting around to uploading all my photos now. those are both MJs with XJ axles. so what do your shackles look like? 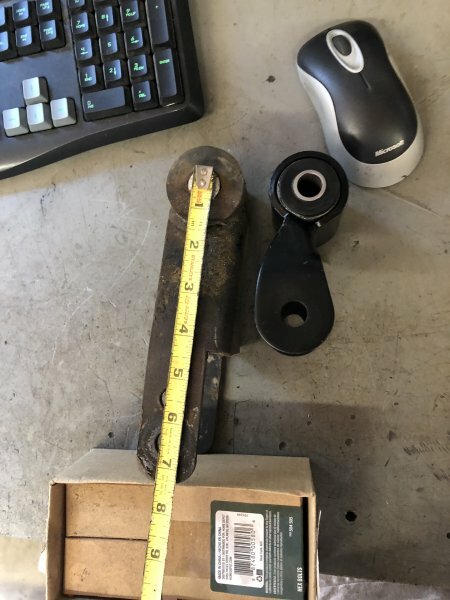 I don't have the oem shackles, I bought my jeep with these giant 6.5" lift shackles. That ended up being way too much after I got it in. 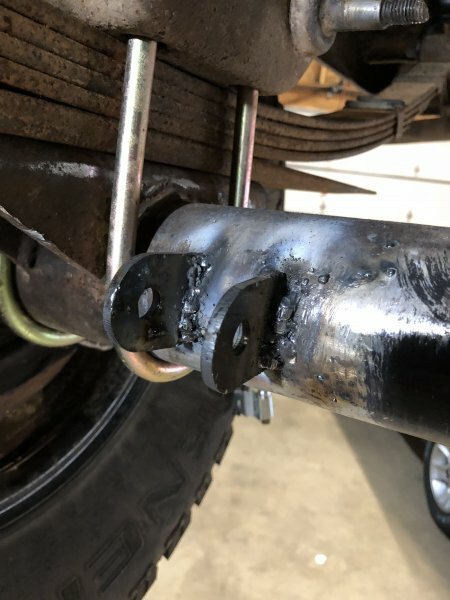 So I switched to a stock xj shackle. 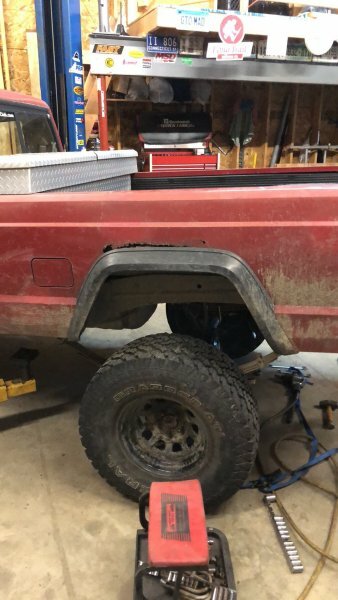 I'm struggling to dig up a side by side picture but after the axle was in, I ended up swapping out the leafs too, the stock mj ones were way too tall for me. Here are the stock leafs with the spring over axle perches on the 8.8. As you can see, really really tall, all I'm planning on running for now is 33s. I bought wagoner leafs from a junkyard. 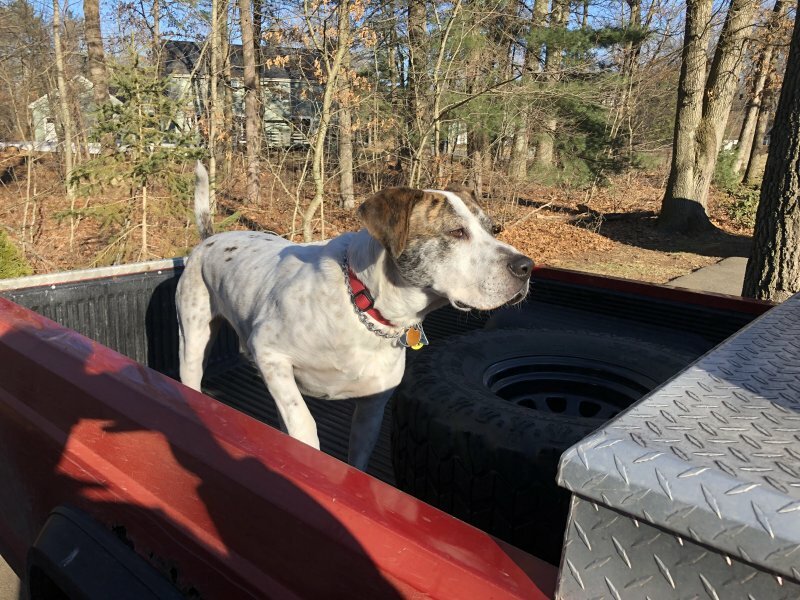 I looked up a big list of leafs someone posted over on pirate4x4 and the measurements matched up except the width at the eyes was about a half inch narrower. This might be where I made up the difference between the XJ and the MJ perch width. 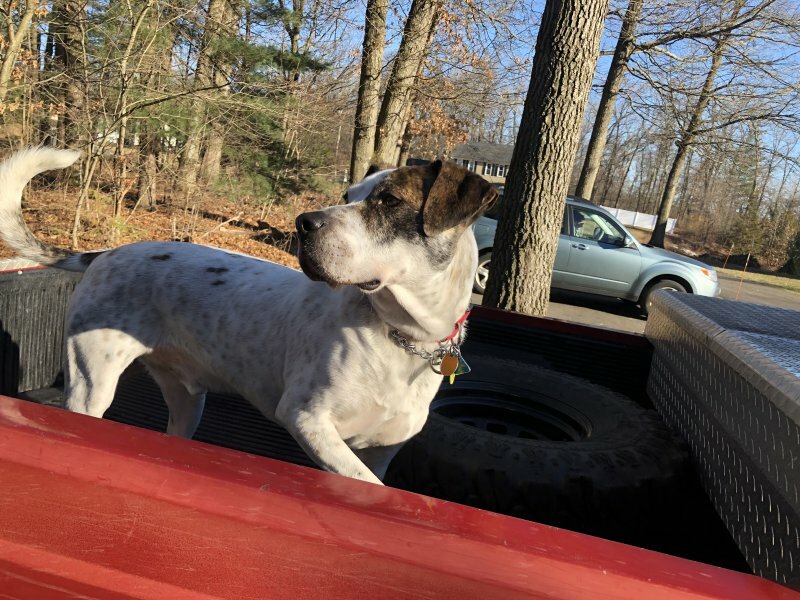 The wagoneer leafs are beefy which I like but they're not a perfect fit. I added a couple washers and even bent the leaf retainers closer. 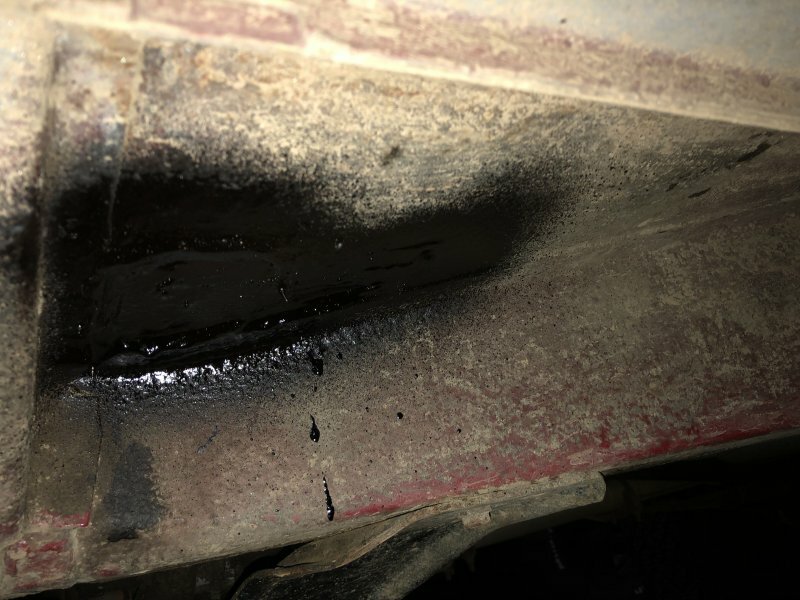 Now that it's torqued down it seems like it got kicked over a tiny bit. Here's a couple pics of the leafs after they were all bolted in. 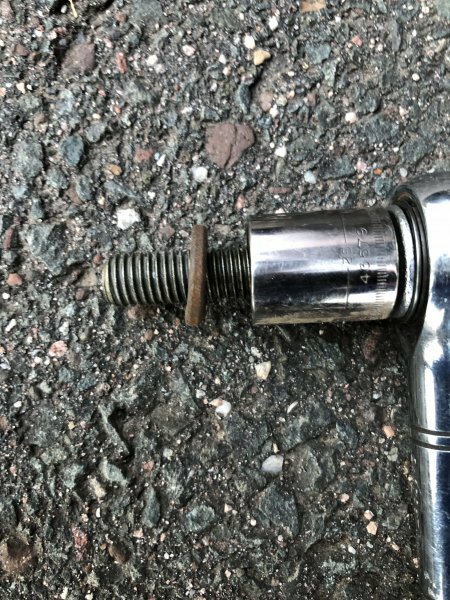 Those ubolts look a little bent, mostly because they are, I reused the same ubolt retainer (is that what you call it?). 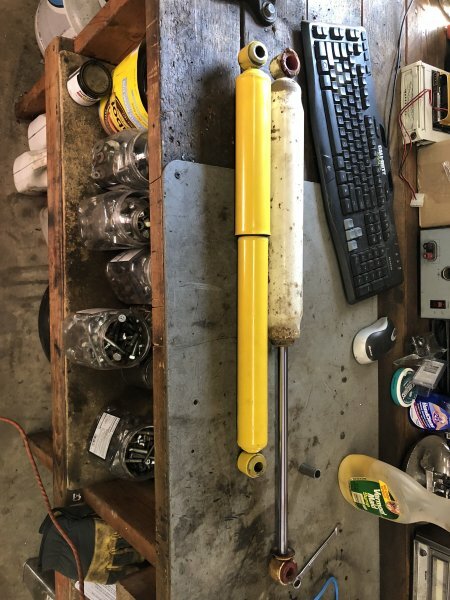 I originally thought I might be able to get away with running shocks to the top of that retainer to reuse the old shock mounting point but no luck, the distance was way too short. 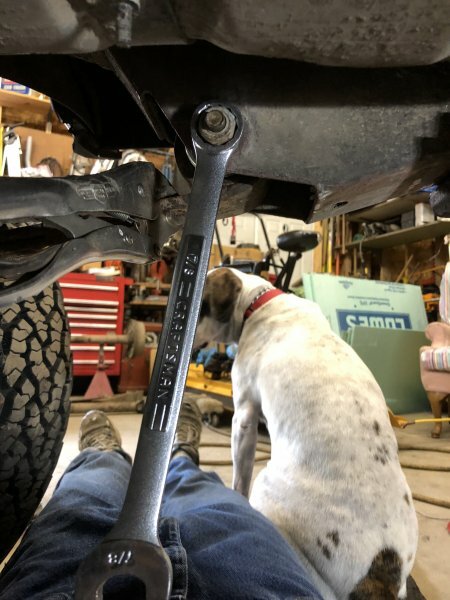 Since I couldn't find any decent shocks to run to the top of the stock leaf retainer (max length was 14 inches, min was about 6) I bought these shock mounts for $15 on ebay. 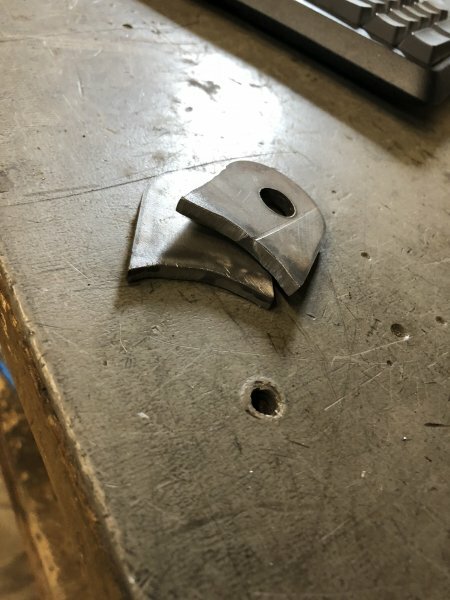 They didn't really fit the axle diameter so I took a bench grinder to it to open it up. Here's the stock leafs, I ended up selling them on ebay for about $100 to a guy in long island. Fair deal for me but I think fedex beat us both with their $112 shipping fee. Caution gore ahead. 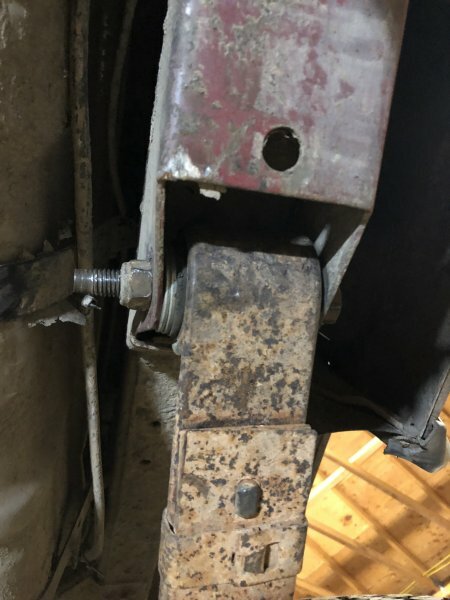 The little mig welder I used for my floor pans isn't powerful enough to weld on these shock brackets. So I used the old lincoln AC225 that's been in the barn for the better part of 30 years and probably used 3 or 4 times. 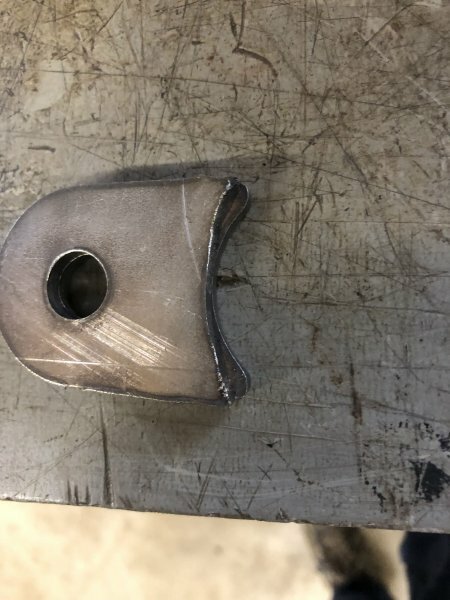 As you can see these weld's are really, really bad. I ran a few extra passes after this just to ensure it doesn't break off. 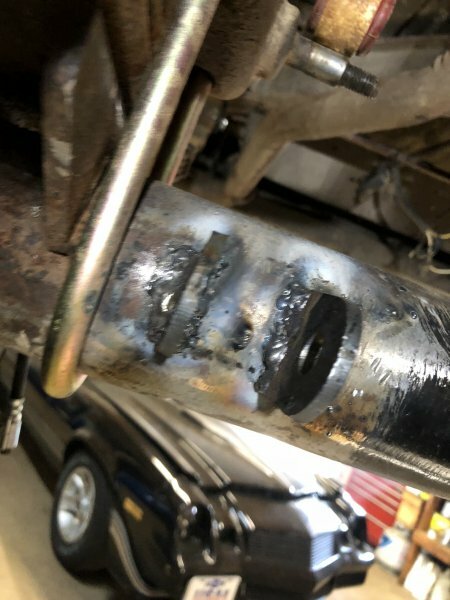 This is my first time really using this welder, I took a couple practice runs on some scrap but it didn't translate that well because I had to change all the amperage. 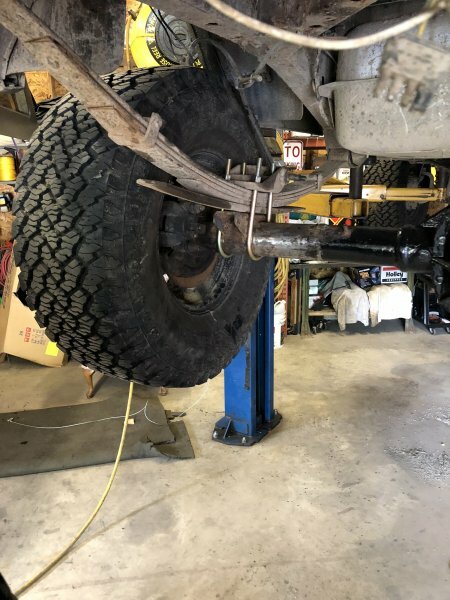 Here's my new shocks! It actually worked out that a stock shock would work just fine. The top one is my old shock, it was way too long and only had about 3 inches of down travel with the new shock mount location.